Home » Posts Tagged "Kim Novak"
Sets best. No, not the hair sets! The Oscar sets. Oscar hair for 2014 was safe, safe, the same old story. 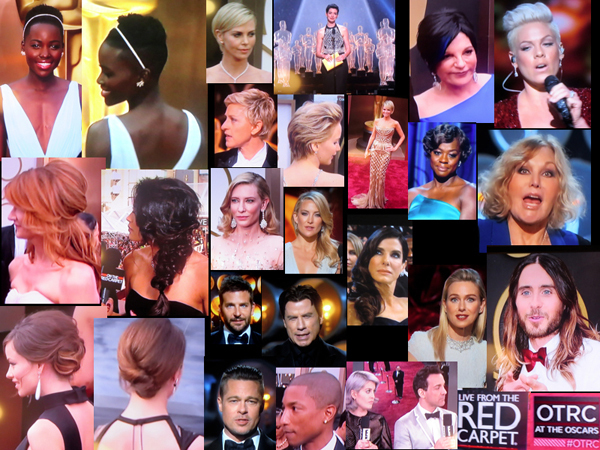 Except for Lupita Nyong’o (Oscar Best Supporting Actress for “12 Years A Slave”) top left, and her mini-mohawk by Larry Simms, but the shaved sides and back won’t work on those not so beautiful. However, her Fred Leighton gold and diamond headband, worn just so, will start a trend. The short haired ones all looked boring: Charlize Theron’s pixie (nothing much) … Anne Hathaway (shorter than ever, with an old-fashioned unflattering cut ) … Liza Minelli at 67 showed some hair interest, with a blue streak … prefer Pink with pink hair … Ellen DeGeneres, a disappointing Oscar host, looks better with her hair a little longer … Jennifer Lawrence’s hair was fuddy-duddy styled and highlighted, but like her necklace dangling down her back … Kristin Chenoweth in her Roberto Cavalli dress had a longer pixie. Viola Davis waved but it could be have been a little less perfect … Kim Novak at 81 should sue her plastic surgeon (her mouth and voice were weird), she needed a fashion stylist but her hair was fine (I got a good photo!!) Second row, left to right: Laura Dern’s hair was romantic, well done … an ABC announcer looked modern with her textured hair to one side ending in a little knot. Cate Blanchett, (Oscar Best Actress for “Blue Jasmine” well deserved) wore a safe waved glam look (but boring) … Kate Hudson and Sandra Bullock ( one-sided long hair, again) … Naomi Watts had a little something going on on top, but nothing much … Jared Leto (Oscar Best Supporting Actor for “Dallas Buying Club”) with his ombrée color could start a long hair trend for men (and extensions?) … Bradley Cooper better without the curls … John Travolta looks more like John Travolta with his well-styled toupée, but it was too shoe-polish black. Bottom row, left to right: Two well done but safe updos on Olivia Wilde and Anna McKendrick. A jewel somewhere would have added a little something. And that goes for all the Oscar 2014 hair. Brad Pitt’s “marine” haircut spoils Brad Pitt … Pharrell Williams wore a tux with shorts by Lanvin with his closely shaven hair and earrings. Kelly Osbourne still with lilac hair (now with re-growth!) worked the red carpet, here with Ryan Seacrest for E. (Thank you to E-TV and ABC-TV. ) Whatever, the Oscar hair was prettier, more wearable, a little teensy little baby bit more interesting than most of the NY Fashion Week Runway hair with all those ponytails, greasy dirty-looking and overly messy looks but, maybe, next year Oscar hair will have a few more influential stars wearing something, well, um, more interesting – and newer – to inspire the mere mortals out there to want something more interesting for their hair, which has looked the same for too many years now.